I was sitting here working on my computer with Media Center running a TV show in the background when an iPhone commercial came on. Apple seems to have purchased the maximum ad inventory allowable on the Discovery Channel because I haven't seen a commercial break yet during the last 1.5 hours where there hasn't been an iPhone commercial. By this point I've pretty much seen them all and wouldn't ordinarily pay attention, but it's amazing how your mind remembers certain images and something about this particular spot caught my attention out of the corner of my eye. I quickly shifted my gaze over to the commercial, but by this point the familiar image was already gone. I quickly rewound and discovered I was right. 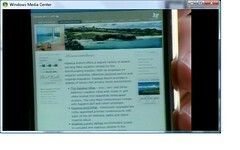 A site I had once worked extensively on (Kapalua resort in Maui) was one of the focal points for the commercial. It's actually been a couple years since I've had anything to do with the site (although from the commercial I noticed that some of the copy I'd once worked with seems largely unchanged . . . probably because it works ;) ) but I still remember it well. It was my first in a series of well over a dozen Hawaii-based clients. What's even more ironic is that I'd just used the site earlier this week as a case study in a pitch to a prospective client. It was the first time I'd actually thought about that particular project in many months and now it's bubbled to the surface twice in one week - the latter instance in obviously a very unexpected way. This still isn't going to make me switch to AT&T just so I can have an iPhone. ;) But I thought it was cool nevertheless.